We’d love your help. 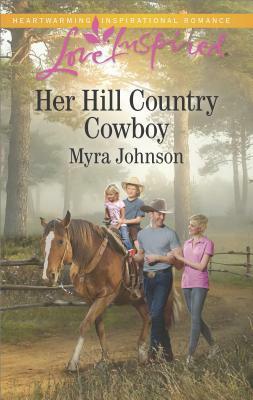 Let us know what’s wrong with this preview of Her Hill Country Cowboy by Myra Johnson. To ask other readers questions about Her Hill Country Cowboy, please sign up. There is something both endearing and infuriating about an overprotective papa. There were times I just wanted to smack Seth upside the head. He's that stubborn and taciturn and then he does a complete flip and is all sweet and tender and caring. What's a girl to do but alternately fume and swoon? So that's what Christina and I did for the duration of the read. Christina has dealt with a lot since her accident and Serenity Hills Guest Ranch seems like the perfect next step in her recovery process There is something both endearing and infuriating about an overprotective papa. There were times I just wanted to smack Seth upside the head. He's that stubborn and taciturn and then he does a complete flip and is all sweet and tender and caring. What's a girl to do but alternately fume and swoon? So that's what Christina and I did for the duration of the read. Christina has dealt with a lot since her accident and Serenity Hills Guest Ranch seems like the perfect next step in her recovery process. Too bad her employer's cranky grandson doesn't agree. And he takes particular exception to Christina's service dog Gracie right from the start. Seth almost fell off my swoon-factor meter over his giving darlin' Gracie the cold shoulder. (That's when the upside-of-the-head-smacking urge started to fester.) Thank goodness Gracie worked her charm -- and, in fact became a dogged matchmaker (pun intended) in many a fun scene. Her Hill Country Cowboy by Myra Johnson. Single father Seth Austin helps run his grandparents guest ranch. Seth is protective of his children. When Christina Hunter is hired as a housekeeper he is not happy when he finds out she use to work for social services before her accident. Christina now has a service dog. Seth's children work their way into Christina's heart as does Seth. Past history for both makes it hard for a relationship. A very touching book. Myra Johnson has penned an unforgettable tale of love amid the struggles of learning to let go of the past in order to find the future God has planned for those who love Him. Myra Johnson’s roots go deep into Texas soil, but she now enjoys the milder climate of the Carolinas. Empty-nesters, Myra and her husband share their home with two loveable (and very spoiled) rescue dogs and the snooty cat they inherited with their daughter and family moved overseas. Her debut novel, One Imperfect Christmas, was a September 2009 release from Abingdon Press. She has over 20 books i Myra Johnson’s roots go deep into Texas soil, but she now enjoys the milder climate of the Carolinas. Empty-nesters, Myra and her husband share their home with two loveable (and very spoiled) rescue dogs and the snooty cat they inherited with their daughter and family moved overseas. Her debut novel, One Imperfect Christmas, was a September 2009 release from Abingdon Press. She has over 20 books in print and is currently writing for Love Inspired. Awards of note: When the Clouds Roll By, Till We Meet Again, Book 1 (Abingdon Press 2013), won the historical fiction category of the 2014 Christian Retailing's Best Award. Autumn Rains (Heartsong Presents 2009), won the 2005 RWA Golden Heart for Best Inspirational Romance Manuscript. Myra is also a two-time ACFW Carol Award finalist.